At the December meeting the United Ford Owners decided that due to lack of volunteers to take over key positions, fewer vendors, and lower attendance the 2018 FALL Super Swap is CANCELLED. A motion was made and the club voted to pull the plug on the event , damn sure not my choice! 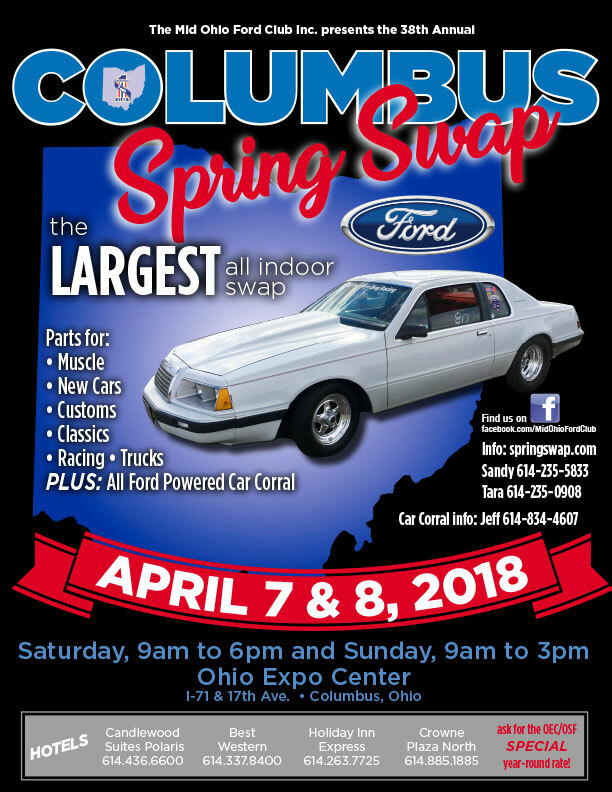 The Mid-Ohio Ford SPRING Super Swap WILL STILL TAKE PLACE...Repeat..the SPRING SWAP meet will still take place! We actually sold more this year, than any other year we have been to this event. Whats the date for the spring event? FALL SWAP IS BACK ON,TAKEN OVER BY A NEW GUY, SPACES ARE ONLY 70.00 < HE LOWERED THE PRICES. All Ford Super Swap & Car Corral. Acres of all Ford products and related parts - new, used, aftermarket, collectibles! Huge all Ford car corral! All indoors and heated! Still the largest Fall Ford meet in the USA! Show Hours: Saturday: 9:00am-5:00pm. Sunday: 9:00am-3:00pm. Spectator Admission: Adult admission $8.00. Children under 12 always free. $70.00 10'x12' Indoor. Voinovich Bldg. $70.00 10'x15' Indoor. Buckeye Bldg.